These are possibly the greenest words ever written on dragondrop. They are written on a device that is using 100% solar power. Arguably all devices are 100% solar powered really but this particular gadget is currently exclusively powered using energy from the sun collected using a solar panel which has fed a ‘desktop’ phone battery charger. Here is the kit – guarded by Misty (a cat). 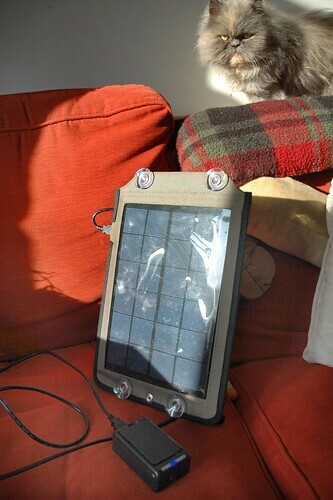 The solar panel (eBay, £25 –a bit like this one) comes in a case that can be free standing, stuck to a window or clipped to a backpack and attached to a charger or gadget (eg MP3 player) via a USB cable. I’ve got a rotation of 3 phone batteries – in good sunlight it charges a dead battery to full in a day – so I can carry on blogging, geocaching, photogro-faffing and generally digitally documenting whilst listening to music etc or using a BlendTec Blender®. even when I’m away from a mains power source – ie camping or a festival or other such deep adventure ops.